In 2012, Brad and I visited Ireland. After whirlwind big-city tourist adventures in Europe, this time we took a change of pace and adopted an uncharted path for our vacation. I’d become disillusioned with big city travel so for Ireland we spent a few weeks with a rented car exploring the southern and western coasts of Ireland. My favorite place in Ireland was the village of Killarney. Blending many of the attractions of a larger city with a still somewhat village-esque feel, Killarney had much to offer. 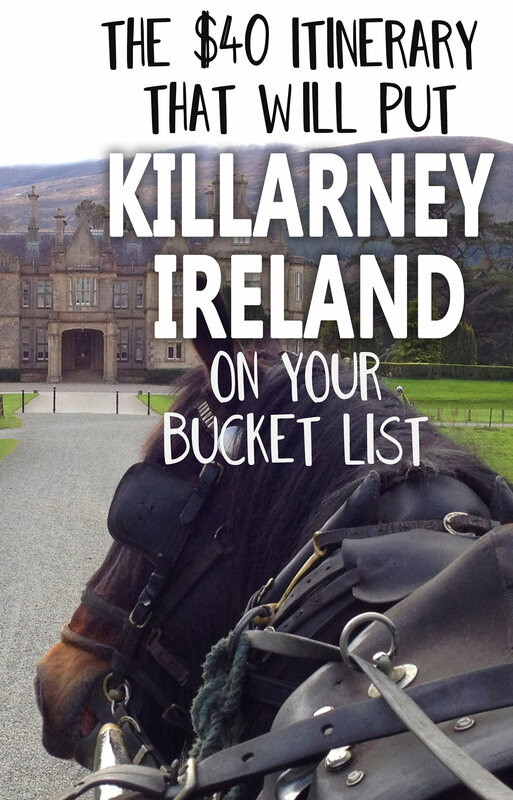 In this blog post I’m reviewing the day’s notes in my travel journal in order to walk through the itinerary from our best day in Killarney, and outline some of the tips and secrets we learned along the way. before I jump into detailed itinerary and tips for navigating Killarney, here are the highlights, with ratings. A stat added means it’s one of my absolutely-can’t-miss recommendations. ★ Boat ride across Lough Leane. COST: This was actually one of our cheaper days in Ireland. Visiting the grounds, gardens, and exterior of Muckross House & Ross Castle are free, Muckross Abby & Innisfallen ruins are free to explore, as is Torc Waterfall- leaving the only expenses of the day to be the option for alternative modes of transportation and food. We skipped the breakfast at our hotel to have brunch at The Lakehouse, which is located between the village proper and Muckross Castle. While the dining room at The Lakehouse features high-end dining in the evenings, brunch (generally the least expensive meal at any restaraunt) was a great choice for traveling on a budget. Breakfast was well prepared, reasonably priced, and offered amazing views from the dining room of the lower lake and the mountains beyond. The Lakehouse’s property includes a walking trail and their privately owned castle ruins accessible only to customers. As patrons at breakfast, we were able to enjoy this extra bonus of our purchase. The nature path lead out to a ruin perched on the edge of the lake in front of the hotel, and offered the opportunity to explore the ruins of a 12th century McCarthy Mor castle. View from the Lake Hotel and the castle ruins on the grounds. After breakfast and exploring the grounds of The Lakehouse we headed towards Killarney National Park where we knew jaunting cars (“ponies and traps” they call them, even though the ponies are Irish Draft Horses) would be waiting. An Irish Draft Horse and traditional cart waiting to carry guests from the road up the lane to Muckross Castle – a bit touristy but so, so much fun. Here is a video of our arrival. Pulling up in a carriage was the really most fantastic possible way to arrive at a manor house! Torc Waterfall almost got cut from our itinerary because of the hike and additional expense of travel (though it is a free attraction), but we were very glad we made the short hike up to the falls- it is a distinctive waterfall that was vibrantly and pervasively surrounded by and reflective off more shades of green than I could have dreamed. On a tip from our carriage driver when he dropped us off at our car, we drove up the road only a few hundred yards from the Muckross House gatehouse to park in a small parking lot nearly adjacent to the ruins of the Muckross Abby. We ventured into the park on foot and were really delighted with the. There mid-day at the beginning of tourist season, there was no one else around and we enjoyed the experience of exploring ruins that had stood for nearly a thousand years. It was beautiful, free, and still in good condition for a ruin. Other ruins we visited had modern handrails or ledge railing installed that detracted from the authenticity- the less “managed” appearance of Muckross Abby combined with the sparse crowd on the grounds that day made it feel as though we were really exploring something off the typical tourist track. Next, we visited Ross Castle, which was just a mile or so from Muckross house (during the summer months, you can hire a boat to carry you across the lake between Muckross House and Ross Castle). Ross castle was a restored tower castle that was fascinating- totally restored on the interior though sparsely decorated according to practicality and the fashion of the day. PICNIC – If you plan to follow this itinerary by starting the day with a large breakfast or brunch, plan a picnic! All of these afternoon spots are ideal locations for picnics, and it can help save a bit of money towards other adventures during your trip. Thankfully we’d packed GoPicnics so were able to avoid the expense of local food vendors. Behind Ross Castle was the largest of the Killarney lakes, Lough Leane, and boat operators with large wooden boats waiting to take passengers to see the ruins on Innisfallen Island in the lake. Unlike most US tourist destinations, hiring a boat operator here is another opportunity to negotiate, and price will vary by time of year, number of boats waiting, and the number of people in your party. (For reference, in March 2012 Brad and I were able to ride in a private boat to the island and back for €20.) The ride was well worth it, our captain was charming, the ride was a nice length, and the views were beautiful. During the ride over our boat’s captain told us all about the islands history as a leper colony ran by monks and then later a boarding school for the elite of Ireland. Again, visiting on the edge of tourist season and late in the day served us well in regards to having privacy on the island. The island was mostly deserted of other tourists during our visit and we saw an entire herd of deer on the island, as we explored the ruins of chapel, and other buildings. By the time our boat deposited us back at Ross Castle we were ready to rest before dinner. After a short rest, we splurged on fine dining at a high-end restaurant in Killarney, to mark with goodness the end of a great day.